cdif is a post-processor of the Unix diff command. It highlights deleted, changed and added words based on word context. You may want to compare character-by-character rather than word-by-word. Option -B option can be used for that purpose. If only one file is specified, cdif reads that file (stdin if no file) as a output from diff command. Lines those don’t look like diff output are simply ignored and printed. Almost same as diff command. Use rcsdiff instead of normal diff. Option –rcs is not required when -rrev is supplied. Compare the data character-by-character context. Specify the diff command to use. Use ANSI color escape sequence for output. 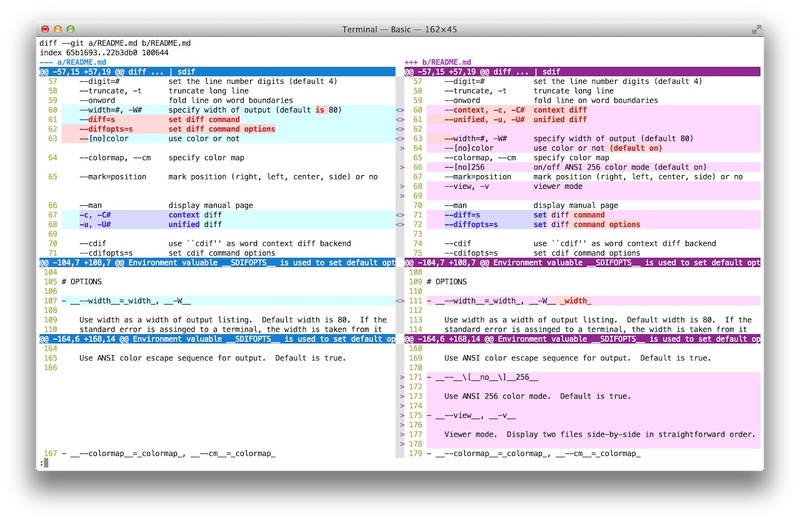 and additional Common and Merged FIELDs for git-diff combined format. 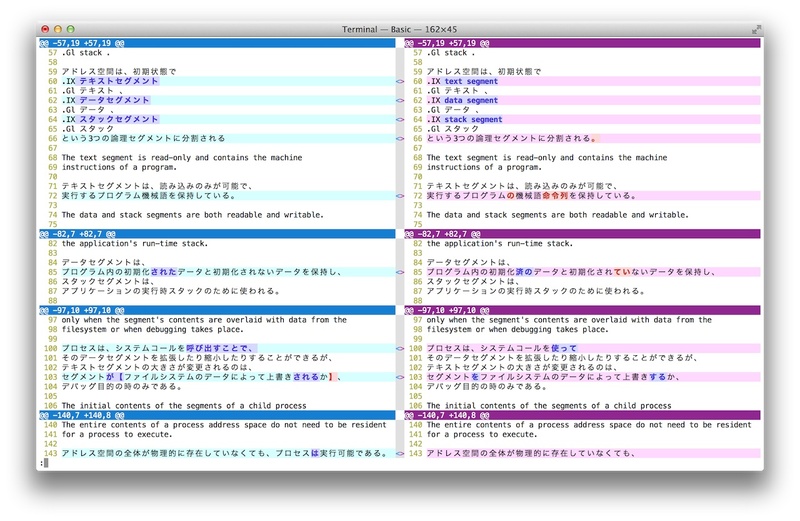 When E is specified for command line, the line is expanded to window width filling up by space characters. Enable/Disable using color for the corresponding field. Print or not old/new text in diff output. Print or not command lines preceding diff output. Print or not lines not look like diff output. Print or not marks at the top of diff output lines. At this point, this option is effective only for unified diff. Next example produces the output exactly same as new except visual effects. These options are prepared for watchdiff(1) command. Print statistical information at the end of output. It shows number of total appended/deleted/changed words in the context of cdif. It’s common to have many insertions and deletions of newlines because of text filling process. So normal information is followed by modified number which ignores insert/delete newlines. Experimental option for using mecab as a tokenizer. To use this option, external command mecab has to be installed. 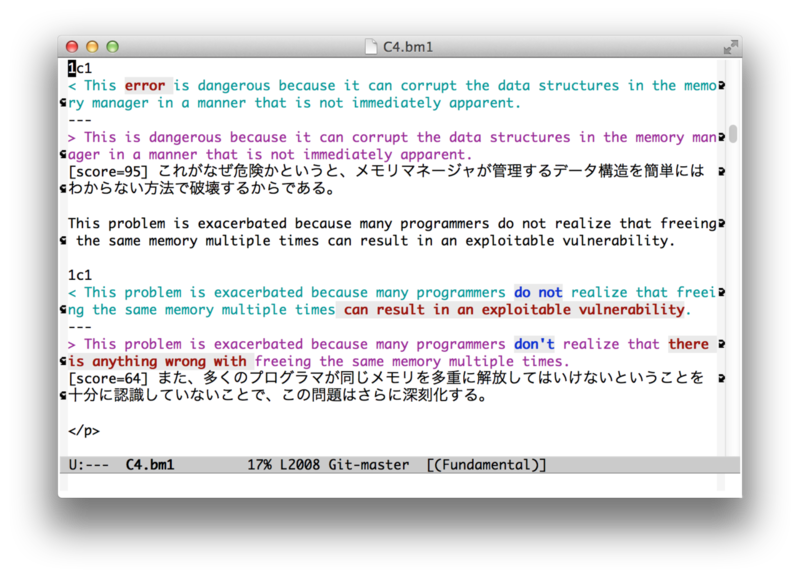 cdif is naturally not very fast because it uses normal diff command as a back-end processor to compare words. Use and redistribution for ANY PURPOSE are granted as long as all copyright notices are retained. Redistribution with modification is allowed provided that you make your modified version obviously distinguishable from the original one. THIS SOFTWARE IS PROVIDED BY THE AUTHOR ``AS IS’’ AND ANY EXPRESS OR IMPLIED WARRANTIES ARE DISCLAIMED.